Like the miners of the turn of the century, who worked tirelessly and persevered through countless struggles to wrestle precious metals from the ground beneath the Gold Mountain mining complex, so too did Passport In Time volunteers from across the country, during the 2010 Gold Mountain Mine Preservation Project. Through the course of the two-week project, volunteers withstood record rain fall, "Gumbo" mud, freezing temperatures, 70 mph winds, tornado warnings, hail, soaring temperatures, physically demanding labor and even a small forest fire. All in all a pretty typical experience when working in the Black Hills of western South Dakota during late spring. 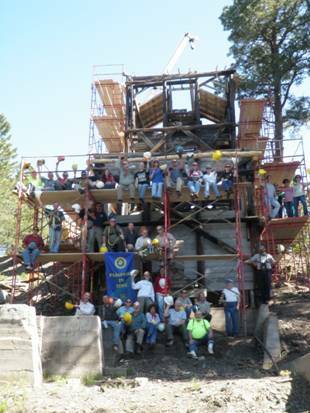 However, in spite of all of these circumstances, the project went forward thanks to the grit and enthusiasm of twenty volunteers determined to save a piece of Black Hills history. Faced with a laundry list of to-do items, many technical challenges and safety concerns, PIT volunteers rose to the challenge and did what they do best -got to work. During the first session (June 14-18) work was concentrated on replacing missing cross members and rehabilitating exsiting structural bracing and refurbishing the interior and exterior of the lower ore bin. In addition, during this week PIT volunteers weather treated new rough-cut lumber and antiqued new hardware being installed on the structure. 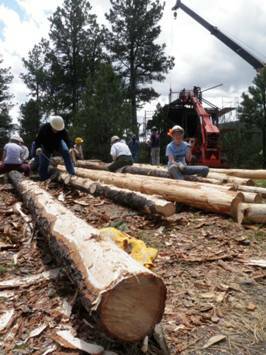 Before the end of this first week, all of the above work had been completed and volunteers began to rehabilite the ore crusher platform and began the process of replacing rotted log bracing on the second level of the structure. On Friday we closed out the first session after a productive week of work and fun; it was truly amazing to see the progress that our first session volunteers had made towards our restoration goals. Like the session proceeding them, the crew from session two did not disapoint. When time ran out on session two at the conclusion of the second week the transformation of the mill frame was remarkable. After two years of PIT projects and three weeks of physical labor the last standing piece of Black Hills mining history had gained a new lease on life. Once slated for demolition (2007), today the Gold Mountain mill frame once again appears much as it did during its original period of activity. Thanks to the countless hours of dedication and hard work of many, Gold Mountain will stand as a glimps into the past, of an industry that was a primary driving force behind the settelment of the American west.